Here is the epic story of Vietnam and the sixties told through the events of a few gripping, passionate days of war and peace in October 1967. They Marched Into Sunlight brings that tumultuous time back to life while exploring questions about the meaning of dissent and the official manipulation of truth, issues as relevant today as they were decades ago. In a seamless narrative, Maraniss weaves together the stories of three very different worlds: the death and heroism of soldiers in Vietnam, the anger and anxiety of antiwar students back home, and the confusion and obfuscating behavior of officials in Washington. To understand what happens to the people in these interconnected stories is to understand America's anguish. Based on thousands of primary documents and 180 on-the-record interviews, the book describes the battles that evoked cultural and political conflicts that still reverberate. "Maraniss. . . is a writer with a masterly sense of narrative pace....The tale unfolds with a magisterial sweep that recaptures the war and its era." "My nominee for must-read nonfiction book of the year. . . . 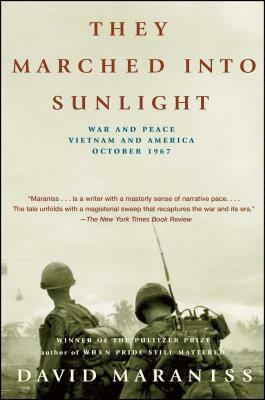 They Marched Into Sunlight is that miraculous thing, a substantive, exhaustively researched work of history that reads like a novel." "A masterful work that brings the conflict back with a rush of cinema verité emotion and tension. . . . Over the years, Vietnam has produced several classics, all of them different: Dispatches, by Michael Herr, and A Bright Shining Lie, by Neil Sheehan. Here is another." "The towering work of nonfiction this year. . . . Maraniss' great achievement is to be epic and intimate at the same time."